I met a brave mother today who is fighting as hard as she can to save her daughters life and she needs as much help as she can. Bethany is 14 years young and she's been battling Leukaemia since she was three years old. She's been through years of chemotherapy and is now desperately, desperately in need of a bone marrow transplant in order to survive. Her family aren't giving up and they need your help to spread the word so that a suitable donor for Bethany can be found. But you need to act now or it will be too late. Joining the register is really simple. Anyone aged 18-40 and in good health can sign up in minutes by completing this application form online, a saliva sample kit will then be sent out to you and if you are match - you could save Beth's life. Its that simple. 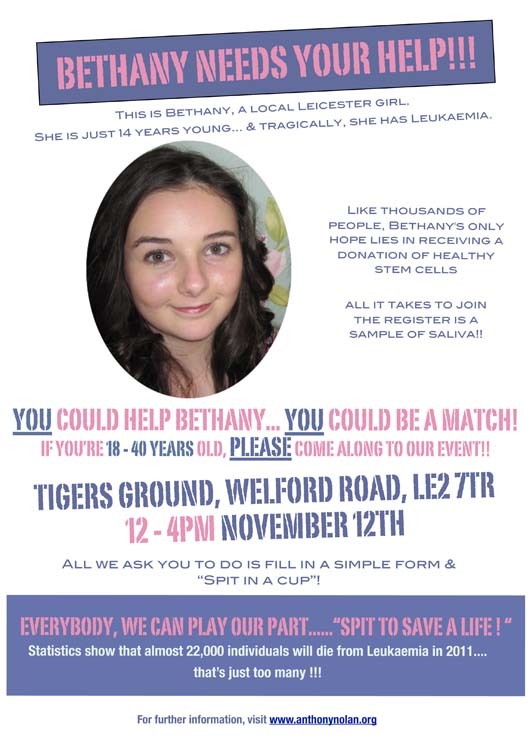 If you live in Leicester please go along to the screening session at The Tigers ground this Saturday 12th November between 12-4pm and please do share the 'Recruitment Drive For Beth' Facebook page with everyone you know. Hearing Bethany's brave mum tell her story was heart wrenching. Please help give this beautiful girl a chance to live. If you do one good thing this week / month / year - let it be this. I'm on the registry already. I hope they find her a donor soon!